Ponds serve as a relaxing focal point for any garden and can help to attract, and provide a home for wildlife including many amphibians and insects whose natural habitat is under threat. One of the most common hurdles that would-be pond keepers face when looking to set up a pond in their own garden is a lack of appropriate outside space. Traditional garden ponds require a relatively large amount of space. For example, even small ponds are likely to measure circa 150 cm long by 150 cm wide. Traditional ponds also require a fair amount of time and money to set up. So what are you to do if you want to create an eco-friendly pond that will help encourage wildlife into your garden, but only have a very limited amount of outside space, and perhaps also a limited budget? 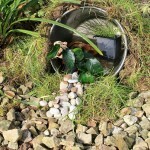 Never fear, a mini wildlife pond could be the perfect solution. So where do you begin? To start, you will need to choose a container for your pond. One of the many great things about creating a mini wildlife pond is that choice of what to use as your container is entirely up to you. You can use anything that is water-tight and clean, from an old washing up bowl to half an oak barrel! Once you have chosen your container, you will need to find an area to bury it in the ground, about a third of the way. This will ensure that it is not easily knocked over and is not too high for wildlife to crawl into. If you do not have access to an area of earth in which to bury your container then you can secure it by placing heavy rocks in the bottom of it. You will also need to build a pathway leading into your container so that wildlife can still access it. A path can be created using natural materials such as pebbles, bark or wood logs. It is also a good idea to add bark and pebbles inside your container so as to provide a platform for wildlife to climb on. Next you will need to fill your container so that it is approximately half full with water. This sounds fairly straightforward; however, it is imperative that if you are using tap water, that you also use a pond dechlorinator. Dechlorinator helps remove harmful chlorine and chloramines found in tap water and therefore makes it safe for aquatic life. Adding live pants to your wildlife pond such as Elodea, more commonly known as pond weed, will help to ensure that it is well oxygenated. This is vital for ensuring the breakdown of decaying waste as well as the survival of plants and pond dwelling wildlife. Plants can also help to enhance the aesthetics of your pond and some common examples of plants that thrive in ponds include; Marsh Marigold, Common Skullcap, Waterlilies, Willow herb, Creeping Jenny and Watercress. It’s also a good idea to add some food to your wildlife pond such as tadpole and frog food. Again this will help encourage wildlife into it. Once your basic setup is complete you can be as creative as you like in terms of adding further natural elements to your pond. For example, you may wish to add plants that grow in such as way that they stick out of the pond and therefore attract insects such as dragon flies. Following this all you need do is remember to top up your pond in hot, dry weather and then you can simply sit back and watch the wildlife that inhabit your pond bring it to life. One of the many great things about a wildlife pond is that it can be as individual as you are. You can hand-pick every element of it, recycling old items such as old washing up bowls, saucepans and even clean ice cream tubs adding natural elements such as plants and pebbles. Of course, the best thing about creating a mini wildlife pond is helping to provide a home for pond-dwelling creatures that sadly are constantly under threat from a reduction in their natural habitat. Further information about wildlife ponds, general pond maintenance and care as well as pond equipment and supplies can be found at Swell UK.